For the sale I was sent a beautiful box by Divine Chocolate. What melts my heart about Divine is that they are a 100% farmer-owned coop out of Ghana that uses fair-trade methods to bring their cocoa directly to producers and, in the late 1990’s, to their own line of chocolate. Here’s just a snippet of their history that you should definitely check out if you want to bring some joy to your Monday (or whenever you read this): Kuapa Kokoo – which means good cocoa growers – has a mission to empower farmers in their efforts to gain a dignified livelihood, to increase women’s participation in all of Kuapa’s activities, and to develop environmentally friendly cultivation of cocoa. With the three containers of cocoa powder sent, I started testing out brownie combos. After the buzz around why I hadn’t included a basic brownie recipe when I reviewed the amazing Kitch and Table mix I adore, I promised a basic recipe and several variations. But, of course, I wanted to blow past that to bring something new and a bit more indulgent to tomorrow’s sale. Then I realized, I’m sorta burnt out by “indulgent” right now. I made Gingerbread Cookie Stuffed brownies, and S’Mores brownies, and Stuffed S’Mores brownies (which basically means that a bunch of charred marshmallows just melts into the brownie and makes it super-super-sweet), and they were all delicious. But they sent me into crazy sugar-shock and that too-full feeling I get when my body is just yelling at me not to overload it. For someone with a normal digestive tract and no hypo/hyper sugar issues, maybe it’s not such an issue. In fact, I ended up baking a second batch of “Stuffed Gingerbread Cookie S’Mores Brownies” and bringing them along, too, because the reaction from my “testers” was so strong. That recipe will be up in a few days. But first I decided to go back to basics and just give you an easy, quick, spot-on gluten-free brownie recipe and a few ways you could alter it depending on what’s in your kitchen. You don’t need a mixer, or any fancy equipment, or even bars or chips of chocolate to melt down. While obviously Divine was the inspiration for these, most people have some sort of cocoa powder in their pantries. Some butter, eggs, sugar and gluten-free flours, and your ready to go. 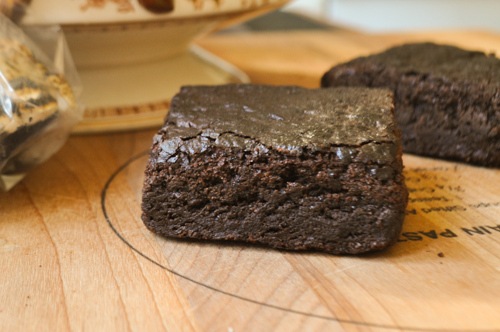 What you’ll get are fudgey, chewy brownies with a crisp top, dense center and slight crumb. Perfect for sharing with loved ones, or those snatching up treats for a good cause. Oh! I also tested a few batches of Chocolate Chip Coffee Cake Muffins with the Divine bars I was sent, and while one recipe tasted amazing and one recipe looked amazing, I haven’t found the balance yet. So that will come. Oh yes, it will. But until then let me know what you think of these brownies. And for more fun, visit No Kid Hungry, Divine Chocolate on Facebook, and the New York City Bake Sale, and check out our Tweets with hashtag #NYCBakeSale. PS: No great pics of these. T’was a rough week in Dusty Baking land, y’all! I love these brownies for truly how easy they are to whip up. Like my Gluten-Free Beer Brownies, they take only minutes to get in the oven. Even better than those beer brownies, though, you don’t even need to light a stove to get these going. I’ve experimented with a few flours for this, and the differences aren’t so extreme that you couldn’t make do with what you have at home – even a store-bought flour blend would probably work. But if you have your own flours at home, have fun with these. Nuttier, fuller flours work with chocolate and brownie recipes well, so break out the quinoa, teff, sorghum etc. as you like! Preheat oven to 325 degrees. Line an 8×8 inch pan with foil, allowing the ends to fall over the edge for easy lifting later, and lightly spray with cooking spray. In a small bowl, whisk together the flours, xanthan, baking powder, and salt. Set aside. In a large bowl, whisk together sugar and cocoa powder. Slowly stream in butter, whisking continually until incorporated fully. Add eggs, one at a time, whisking thoroughly between additions until really well whisked in there. Sprinkle the dry mixture over the bowl, and stir in until just incorporated. Spread in prepared pan and bake for 30 minutes or until the top edge is cracked and a fork inserted in the middle comes out clean. Cool as long as you can possibly wait before cutting. I don’t have quinoa flour. What would be a good substitution? I’m really looking forward to making these. We’re really looking for a good, easy brownie recipe. The others I’ve tried are very greasy and too chewy or hard. What else do you have? Sorghum could work, or buckwheat, or millet. I wouldn’t use another rice or any more starch, something fortifying. Because of the chocolate most flavors of flour are masked well, so just don’t go for something too cakey. Thanks so much. I do have sorghum, almond, amaranth, and soy. I do love brownies! I do!